I also have a new car! I’ll post more about the process of acquiring it–thank God I only have to do it once in a blue moon–but Mango Terrier achieved a perfect score in the terrier stakes, providing me with tons of useful information and encouraging me to snap at the dealers’ heels (and even to land the occasional small bite). 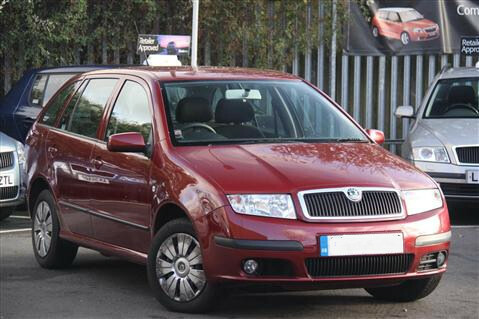 Anyway, it’s a Skoda Fabia Estate (old model) with a 1.9 TDI engine. Very responsive, and tres comfy since it even has heated seats–whoohooo! It’s 3 years old and has 48k miles on the clock, but I’m reliably informed that that’s okay with this sort of engine. One careful lady owner has owned it, and so it’s beautiful to look at and unmarked. It has a full and immaculate service history etc. Poor thing, to be coming to somebody as chaotic with cars as me… Piglet’s crate now lives in the boot, rather than on the back seat, and since she can no longer stick a paw through the bars and poke me in the back she’s reading more, which is also a good thing. I hope eventually to train her to navigate, while she waits to be old enough to apply for a driving licence. Here’s one just like it that I made earlier.